The question of what Council should do about car wrecks comes up quite often in many contexts. Some property owners, considering them eyesores and a detriment to the natural beauty of Witless Bay, wonder about their negative impact on property values in the community. Tidy Towns judges certainly consider them a detriment to a town’s attractiveness. Since being named one of the Province’s “Tidy Towns” can translate into significant monies for the town (in terms of tourism dollars, property values, grants, etc. ), it makes good business sense to address the issue. 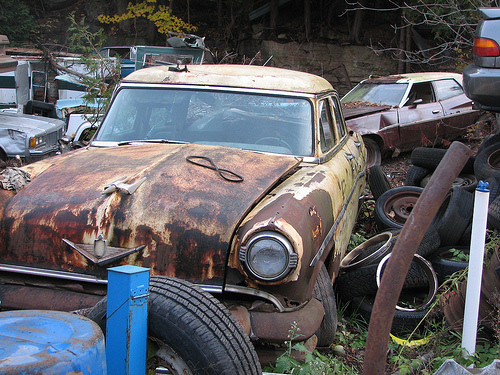 Some property owners, however, feel that allowing residents to keep junk cars is a reasonable expectation, since wrecks can be a valuable resource for their owners. In the rural context that is Witless Bay, property owners expect a relatively high level of leeway in terms of what they can do on their own land. This makes legislating against “eyesores” a thorny issue. To add to the complexity of this issue, the forced removal of wrecks would take away what can be an important resource for those most likely in need of it. Recognizing the complexity of the issue, the members of the Community Enhancement Committee have thought of a number of possible solutions. Using honey instead of vinegar, as one resident put it, might be the solution. Council could offer an incentive for the removal of “eyesores” from private property. As the Community Enhancement Committee worked on a solution to this issue, we discussed a number of ideas. OPTION #1: One possibility is the option chosen by a number of towns in Newfoundland, who offer a free car wreck pickup service once yearly (Example: Pasadena). In addition to this, some towns have a policy that wrecks not voluntarily removed under their “free removal” program are then removed by the Town, with the cost of removal charged to the owners (Example: Gambo). While these “free removal” programs are a great idea, they can require a lot of legwork on the part of Council and Council staff, who also must work to ensure that the town gets a good price for the wrecks. The Town is also responsible for ensuring that the removal is done properly, or else the municipality could be held responsible for damages caused. OPTION #2: A “do-it-yourself” solution, on the other hand, gives property owners more options at no cost and no risk to the town. A number of towns simply invite residents during “clean-up month” (normally in May) to contact recyclers, who come and pick up the vehicles. These towns collect the names of the businesses who do this in the region, and include this in the Town’s newsletter. 2. The property would have to remain completely free of wrecks until the end of the year for which the rebate is applied. 3. The wrecks would have to be disposed of outside of the legal boundaries of the community. 4. Council members and staff would be ineligible for this program. NLL (726-1777) will pick up wrecks & pay $50 per complete car. Newco Metals (753-3070) pays $100 for cars brought to their site on Torbay Rd.